Do you know what MyOfficeTab is? 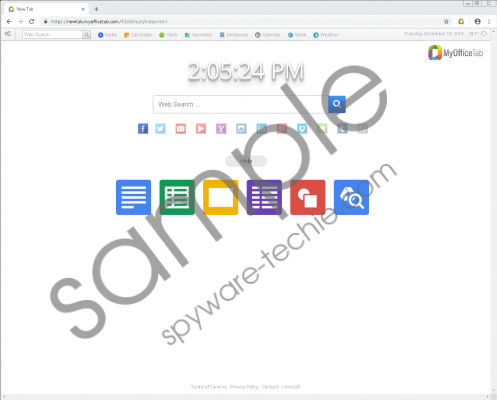 MyOfficeTab is an extension for Google Chrome users, and it can be downloaded for free from the official download website, myofficetab.com, and the Chrome web store – which is where the installer is hosted – chrome.google.com/webstore/detail/myofficetab/efaaaiddmmcbkijhpmfpbgidlmcihmie. At the time of research, there weren’t many people who had downloaded this extension, and that is no surprise for us. The extension might provide you with access to a bunch of legitimate websites from your browser’s New Tab page, but you can easily bookmark the same websites. Also, the search service integrated into the tool is not trustworthy. It does not take long to figure this out if you take your time to do your research. Hopefully, that is what you are doing right now. However, if you are looking for a way to remove MyOfficeTab, we are glad to help as well. When you install MyOfficeTab, you agree to have newtab.myofficetab.com/43/default/index.html set as your New Tab page. This page is not entirely useless as it presents links to such virtual tools as Radio, Calculator, Clock, Converter, Dictionary, Calendar, Stick, and Weather. Also, it provides easy-access links to Facebook, Twitter, Gmail, Yahoo, YouTube, Instagram, LinkedIn, and a bunch of other legitimate and popular websites. As we already discussed, the file-creating services are not unique, and you do not need them, and when it comes to popular websites, you can bookmark them for easy access. That being said, our greatest concern is with the search tool offered by MyOfficeTab. It looks normal, but when you enter keywords into the search field, you are redirected without permission. You are redirected to Yahoo Search, and so you might think that you are safe, but you are not because the results are modified. If you do not want to face potentially unreliable search results, you want to delete the PUP. If MyOfficeTab is the only headache you have, deleting it should not be too complicated. Just follow the instructions below, and you will have it gone and forgotten soon. However, if other PUPs or even malicious infections exist, you want to be mindful. Can you delete MyOfficeTab along with other threats yourself? Can you protect your operating system afterward? We propose installing anti-malware software. Even if the suspicious extension is your only worry, once anti-malware software is employed, you will not need to think about malware removal or protection against threats, and that can give you peace of mind. Open the browser and then tap keys Alt+F. In the Chrome menu on the right click More tools. Select Extensions and find the undesirable add-on. In the Clear browsing data menu select a time range. Mark the boxes you want. Even though MyOfficeTab might look like a beneficial tool, it uses links to other websites as a disguise. The real service of this potentially unwanted program is the web search, and, unfortunately, it is not one you can trust. Our researchers have found that the PUP redirects without permission and shows modified Yahoo Search results. Without a doubt, you want to delete MyOfficeTab from your browsers, and you can do it yourself (use the manual removal guide above) or using anti-malware software. We recommend choosing the latter option in any case, but you should be especially inclined to install security software if there are other threats that require removal and if you need help protecting your browsers and the entire operating system against unwanted programs and threats. Tags: delete MyOfficeTab, MyOfficeTab, remove MyOfficeTab.